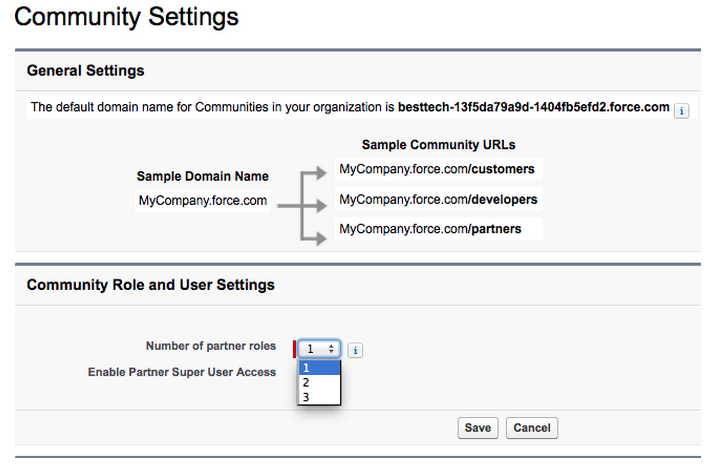 How to Provision Salesforce Communities Users? Learn the basic mechanics for provisioning a community user including the different techniques available to provision users, either manually or in an automated fashion. If you’re building or managing a Salesforce community, eventually you’ll need to create community users. This process is referred to as user provisioning. In this article, we’ll explain the basic mechanics for provisioning a community user and give an overview of the different techniques available to provision users, either manually or in an automated fashion. We are only focusing on external user provisioning (e.g. : a partner, a customer); we will not cover Salesforce user provisioning. Create a contact record and associate it to an account. Create a user record from the contact and assign a user profile that has access to your communities. * You convert an account into a “Partner account” by selecting “Manage External Account > Enable as Partner” on the Account Detail page. Remember that the account used to create external users must be owned by an internal user, typically a Channel Manager. This applies to all account types. As an administrator, you may need to add a user when a new partner or customer needs access to your community. Go to the Contact detail page. You are taken to the User detail page. Be sure to select a profile for the new user that has already been added to the community. Click Save to create the user. If you enabled the “Welcome Email” for your community, an email with username and a link to set password is sent to this user. If the profile is associated with multiple Communities, the user receives one email per published community, but only the first email contains username and a link to set the password. As opposed to Customer Community users, Partner users are role-based. The role is defined at the Account level. The Partner Account can have between one and three roles (based on the org-level setting defined in Community settings). We suggest that you limit the number of roles for optimal performance. For B2C Communities, it often makes sense to let visitors self-register. Go to the Communities setup overlay, select the “Login Page” tab, and enable Self-Registration. Optionally, select a default profile to assign to self-registered users. Only profiles that were previously added to the community are shown. Edit the CommunitiesSelfRegController to include the Account ID you want to associate self-registered users with. This step is mandatory. If you’re creating a user associated to a license that does not have roles (e.g. : Customer Community), you’re done. Otherwise, you need to assign a role to the new user. Note that there’s a known issue that forces all self-registered users to be associated with the lowest role in the hierarchy. In this example, we did not assign a profile ID to profileID because we’ve already associated a profile in the Self-Reg Communities setup. Setting a value in the controller will overwrite the default Self-Reg profile. 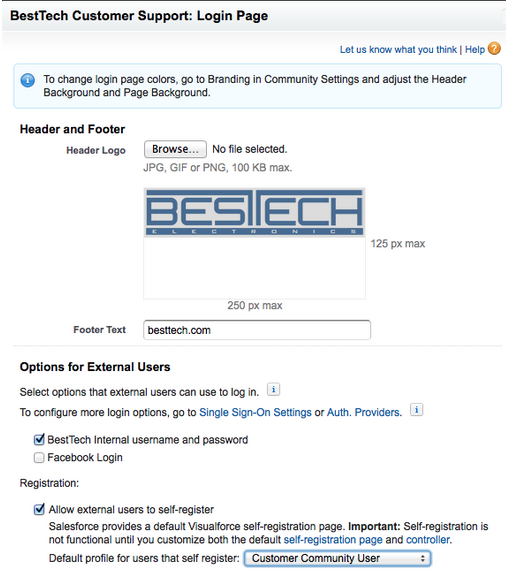 We provide a default Self-Registration page called CommunitiesSelfReg that you can customize and brand as needed. If a user doesn’t create a password during self-registration—either because they left the password field blank or your organization customized the self-registration form to omit the password field—the CommunitiesSelfRegConfirm page and CommunitiesSelfRegConfirm controller confirm that a password reset email has been sent. Users landing on this page can’t log in until they reset their password. You can provision community users by using the SOAP or REST API on the User object. When using this API, keep in mind that the Community user has to be associated to a valid contact and account so these fields need to be set. The account must also be owned by a Salesforce user that has a role. createPortalUser(user, accountId, password) lets you create an external user associated to a Customer or Partner account. createPersonAccountPortalUser(user, ownerId, password) lets you create an external user associated to a Person Account. Social Sign-On enables users to authenticate from a range of identity providers, including Facebook, Google, Microsoft, Amazon, Paypal, any OpenID Connect provider, and even other salesforce.com orgs ( future plans include support for LinkedIn and Twitter as well ). Social sign-on is key to a new way of acquiring prospects, and servicing customers. As part of the process users are created or updated on the fly using Registration Handlers. With Just-in-Time provisioning, you can use a SAML assertion to create regular and portal users on the fly the first time they try to log in. This eliminates the need to create user accounts in advance. For example, if you have a customer that needs access to your support Community, you don’t need to manually create the user in Salesforce. When they log in with single sign-on, their account is automatically created for them, eliminating the time and effort with on-boarding the account. This greatly simplifies the integration work required in scenarios where users need to be dynamically provisioned, by combining the provisioning and single sign-on processes into a single message. It’s required that you use Federation ID as your SAML Subject’s NameID. This is a string of 512 characters or less that is used as an external id for your users. It must be unique across the org, and it is case-sensitive. It does not have to have any specific format (in particular, it does not need to be in the form of an email address). Some other fields can be populated on a new Account record, including AnnualRevenue, TickerSymbol, and custom fields. Account Names and AccountNumbers must be unique. This is not a problem if all Account records are created using SAML assertions, since an existing Account record with a matching Name and AccountNumber will be used. However, if an Account record is manually created with the same Name and AccountNumber as an existing Account record (which can be done), then SAML authentication referencing that Account record will fail (“MULTIPLE_ACCOUNTS_FOUND” error). Contact.Email: A unique email address. As noted above, this email address must be unique across all Contacts on all Accounts, even those Accounts not enabled as Partner Accounts. Some other fields can be populated on a new Contact record, including FirstName and custom fields. User.Email: A string in the form of an email address. This does not need to be unique. (3) ‘Worker’ is the token for specifying the Community User role. User.FirstName is optional. JIT provisioning is currently not supported for Person Accounts. We plan to add support for this account type in the near future. Data Loader is a great option for non-developers who want to mass upload users. You can install it from here. Set up your Community accounts (Partner or Customer). Add contacts to the accounts. Create the Community Role that your Users will be using (for role-based users only). Create a .csv import file for importing users. Export the contacts for which you want to create users. Add contact info to the .csv import file; complete empty fields. Import the .csv file through Data Loader. 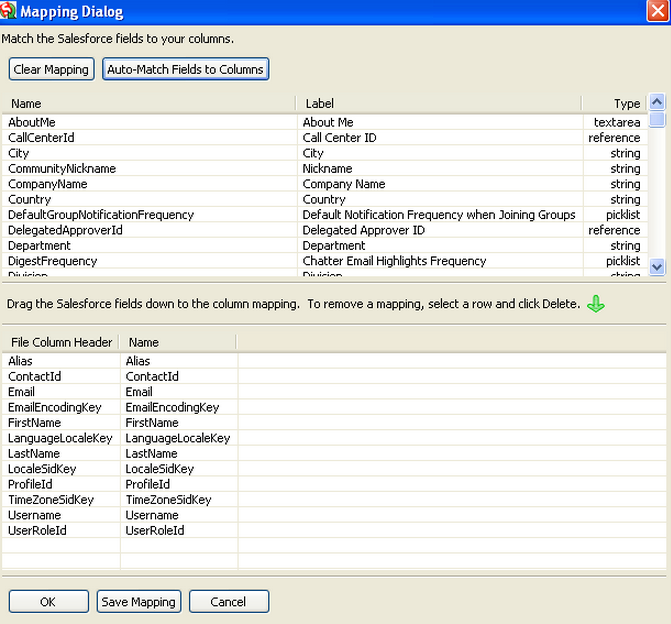 Once the csv file is created, use Data Loader to upload it and create the User records. You can use the createPortalUser and createPersonAccountPortalUser methods in an Apex class to create users in bulk. If you plan to mass provision Partner Person Accounts, be aware of this limit. While most customers choose to store their users directly in Salesforce, some may wish to synchronize with Active Directory. While API or Bulk provisioning may be used, Salesforce also offers capabilities to synchronize with the directory via Salesforce Identity Connect.